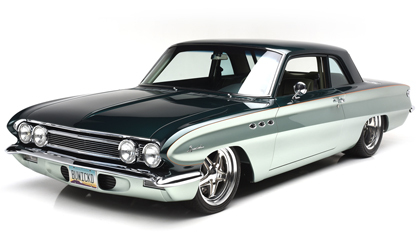 SCOTTSDALE, ARIZ. – Dec. 29, 2016 – Barrett-Jackson is offering exclusively through its showroom one of the most elegant and famous custom cars in the world, the 1962 Buick dubbed Bu’Wicked, owned by collectors Ted and Sue Richardson. Consigned for sale to Craig Jackson’s team in Scottsdale, the big-block Buick-powered Resto-Mod was the star of the show car circuit and Sony’s “Gran Turismo 4” video game. Buick enthusiasts Ted and Sue Richardson selected a 1962 Buick Special, which was Motor Trend magazine’s 1962 Car of the Year, as the basis of their project. Starting with an illustration by Justin Milburn, the Richardsons hired the late Ryan Butler of Bill McGlaughlin’s Hot Rod Fabrication to construct Bu’Wicked. Among other superb custom features, the car boasts a full Art Morrison tube chassis and Heidts coilover front suspension, as well as a supercharged Buick 455 with aluminum heads, a custom intake manifold, headers and exhaust system. The engine sends 700 horsepower and 750 ft/lbs of torque to the Richmond 6-speed stick. Inside, the austere interior was transformed to match the two-tone body with tasteful Lambo Orange pinstriping. Shortly after its debut, the car graced the cover of Custom Rodder magazine and was featured in Popular Hot Rodding. Bu’Wicked reached immortality as a playable car in Sony’s “Gran Turismo 4” game for the PlayStation 2. Established in 1971 and headquartered in Scottsdale, Arizona, Barrett-Jackson is the leader in collector car and automotive lifestyle, which include auctions, VIP experiences, a private showroom and authentic automobilia. With an unprecedented expert staff having over 130 years of combined industry experience in the automotive field, Barrett-Jackson is a proven brand in the industry for excellence in all things automotive-related. The company produces The World’s Greatest Collector Car Auctions® in Scottsdale, Arizona; Palm Beach, Florida; at Mohegan Sun in Connecticut, and Las Vegas, Nevada. With broadcast partners Velocity and Discovery Channel, Barrett-Jackson will feature extensive live television coverage in 2017, including broadcasts in over 100 countries internationally. Barrett-Jackson also endorses a one-of-a-kind collector car insurance for collector vehicles and other valued belongings. For more information about Barrett-Jackson, visit http://www.barrett-jackson.com or call 480-421-6694. At the Barrett-Jackson Collection Showroom, enthusiasts can enjoy Barrett-Jackson quality and service year-round. Sell, consign or purchase with confidence as the experienced team guides customers through the process. The Showroom features a rotating selection of premium vehicles that meet the high standards for which Barrett-Jackson is known. The Showroom also has a dedicated service department, overseen by an ASE-certified mechanic. The service department is the perfect choice for car owners looking for excellent repair, maintenance and light reconditioning of not only collector cars, but modern specialty cars as well. For more information about The Barrett-Jackson Collection Showroom, visit http://www.barrettjacksoncollectionshowroom.com/ or call 480-306-8210.